This will be the last article in this series. Up until now, the articles have been about what winnings team do and what the Mets have done. The Mets minor league system is right now ranked as one of the worst, so it is not like salvation is right around the corner. In this final article, I will discuss how I would advise the Mets moving forward from 2018. For starters, we need to lay out a plan. Each player of relevance needs to be in a category and know where he stands. Despite the struggles, the Mets need to give Rosario time to mature. Group 1: This is for the untouchable players. These are the players who under almost no circumstance should the Mets trade. The members of this groups are Brandon Nimmo, Michael Conforto, Amed Rosario and Noah Syndergaard. Syndergaard could be traded but only given the chance to raid another teams minor league system. Group 2: Here we have guys who are part of the future but are not in that elite category of untouchable players. This group includes Steven Matz, T.J. Rivera, Seth Lugo, Robert Gsellman and Kevin Plawecki. Lugo has a future either as a starter or in the pen. The G-man could be a closer if the Mets don’t sign one in the offseason. Plaw is the one that few people would put here. However, his high OBP as a backup for the second year in a row makes him a guy you don’t give up on since he has a favorable contract situation. Plawecki has once again been adept to getting on base. Group 3: Players here are the ones who haven’t proved themselves yet, but the Mets should hold onto and give another chance. This category includes Dominic Smith, Luis Guillorme, Tomas Nido and Gerson Bautista. All have been frustrating at times but we shouldn’t get rid of them so quickly. It could be that they will improve with some more seasoning in the minors. Group 4: These are the players that the Mets should try to trade. Before the deadline the Mets should try to deal Asdrubal Cabrera and Jeurys Familia. Jose Bautista may have significantly increased his value now that he has an OPS around .900 with the Mets and a WAR of 1.3 in minimal playing time. Jerry Blevins is also a guy who the Mets should try to sell off. His bad season means that some team may try to get him cheap. Lastly, I put Jacob deGrom here. However, if the Mets do make this trade, they need to get at least two blue chip prospects and three respectable ones. This would need to dramatically improve the organization. Group 5: These are players who should never play another game in a Mets uniform. AJ Ramos is out for the year and won’t be back. Rafael Montero has been given too many chances. Perhaps the Mets can give him a shot once he is back from Tommy John, but unless he dramatically improves, the Mets should dump him. Jose Reyes is a player whose presence in Queens baffles even the greatest of baseball minds. The Mets and Reyes need to part ways. Group 6: This is the depressing group. These are players who don’t have much value and the Mets are stuck with their contracts. Yoenis Cespedes, David Wright, Jay Bruce, Todd Frazier, Juan Lagares and Anthony Swarzak are all here. I could see Swarzak bouncing back in 2019. Possibly even Bruce or Frazier could turn things around next year. However, the rest of the guys are just riding out their contracts. Group 7: This is the undecided group. Everyone here has been good and it is hard to tell if they are going to be part of the rebuild. Travis d’Arnaud is unfortunately never healthy. I wouldn’t just dump him, but his future is a question mark. Devin Mesoraco is someone I would consider a offering no more than a one-year deal after the season. However, let’s not kid ourselves into thinking he is the catcher of the future. Wilmer Flores should stay if the Mets decide to consider him an everyday player in 2019. If not, they should be decent enough to trade him to a team that will realize how good he is. Zack Wheeler is a tough one. He has a FIP of 3.66, which indicates he may just have bad luck this year. Also at age 28, he isn’t a youngster anymore. Now that we have a general idea of what to do with the players, the Mets need to work on several other things that don’t get noticed daily. To begin, there have been a lot of questions about the Mets player development. For example, how come the speedy Rosario has only four steals on the season and has been caught another four times? Where are his base running skills? How come Dom Smith doesn’t know how to bunt? Nido had poor minor league numbers in 2017 and 2018 but was rushed to the majors anyway. In recent weeks there have been some pretty damning articles about state of the minor league system. This needs to be taken seriously for the Mets to compete. Dominic Smith’s inability to bunt should send shock waves throughout the Mets minor league system. Lastly, the Mets need to work to fix their strength and conditioning. While it has improved since 2017, the Mets have too many injuries for comfort that are being mismanaged. No one really knows the deal with Cespedes. How did Thor’s finger strain become such a major injury? 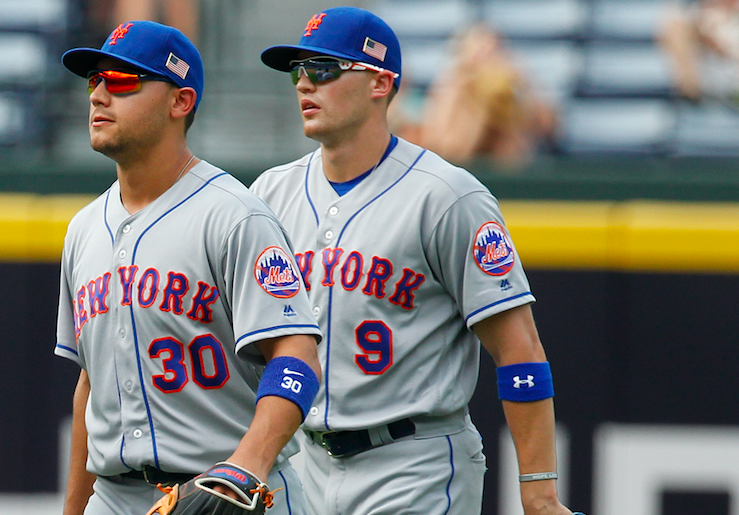 How do the Mets have two position players recovering from Tommy John? Why was Bruce allowed to play so long when it was clear he was hurt? When all is said and done, the Mets will once again have a season with too many key players spending far too much time out with injuries. Again, this isn’t on the level of 2017 but the Mets never seem to be playing at full strength. Conclusion: The Mets are not in a good situation. As fans, we need to accept that another dark age is upon us. Simply trying to sign more free agents isn’t likely going to fix this. The Mets usually take 3-6 years to turn things around, but eventually we will get back to greatness. We need to wait for the players in the minors to develop and use this season as one to learn from.